Sunny Leone is one of the Bollywood celebrities, who has emerged to be a bold and loving personality. The actor has been grabbing headlines in recent times, for all the right reasons. From her funny TikTok videos to her pristine family pictures, Sunny is making her way to the audiences’ hearts. 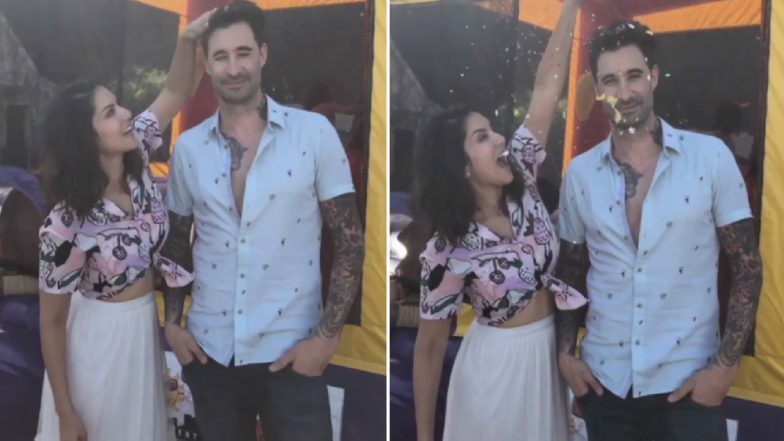 Now, cherishing the upcoming Easter glee, the Ek Paheli Leela actor has already begun the early celebration with husband Daniel Weber. Sunny shared an early Easter video on Instagram and it appears to be super fun. Sunny Leone Dances Hilariously on Sapna Chaudhary's Song 'Teri Aakhya Ka Yo Kajal' in This Viral Video! Easter is one of the most important festivals celebrated by Christians and the holy week thus concludes on Easter Sunday, the day Jesus Christ rose from the dead. This year, Easter is on Sunday, April 21. Sunny Leone's TikTok Videos on Sadi Gali and Bolo Tara Rara Will Give You an Instant Rush of Energy. On the work front, the actor was last seen in her own biopic Karenjit Kaur: The Untold Story of Sunny Leone, which streamed on Zee5. Sunny is all set to make her cameo in Arjun Patiala. The movie stars Diljit Dosanjh and Kriti Sanon in the lead roles.